The Big Wobble: Signs and wonders! The strongest hurricane to hit Puerto Rico in more than 80 years has "destroyed everything in its path." Signs and wonders! The strongest hurricane to hit Puerto Rico in more than 80 years has "destroyed everything in its path." The strongest hurricane to hit Puerto Rico in more than 80 years destroyed hundreds of homes, knocked out power across the entire island and turned some streets into raging rivers Wednesday in an onslaught that could plunge the U.S. territory deeper into financial crisis. "Once we're able to go outside, we're going to find our island destroyed," warned Abner Gomez, Puerto Rico's emergency management director. "The information we have received is not encouraging. It's a system that has destroyed everything in its path." As people waited in shelters or took cover inside stairwells, bathrooms and closets, Maria brought down cell towers and power lines, snapped trees, tore off roofs and unloaded at least 20 inches (50 centimetres) of rain. Widespread flooding was reported, with dozens of cars half-submerged in some neighbourhoods and many streets turned into rivers. People calling local radio stations reported that doors were being torn off their hinges and a water tank flew away. 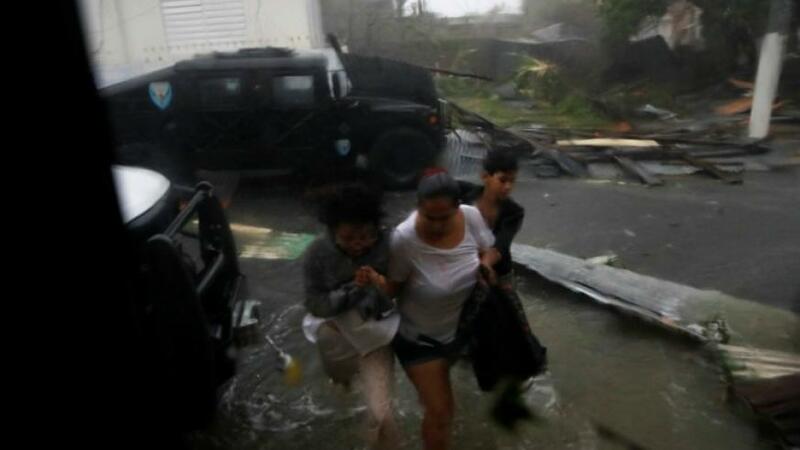 Felix Delgado, mayor of the northern coastal city of Catano, told The Associated Press that 80 percent of the 454 homes in a neighbourhood known as Juana Matos were destroyed. The fishing community near San Juan Bay was hit with a storm surge of more than 4 feet (1.2 metres), he said. "We are at a critical moment in the effort to help thousands of Puerto Ricans that urgently need aid and to assess the great damage caused by Hurricane Maria," he said. "Maintaining public order will be essential." Rossello said in an interview on CNN's "Anderson Cooper 360" that one fatality has been reported but because communications were knocked out in some areas, the total casualty count wasn't known. Maria had weakened into a Category 2 hurricane with winds of 110 mph (175 kph). It was centred just off the northwestern corner of Puerto Rico, moving at 12 mph (19 kph). Rossello urged people to have faith: "We are stronger than any hurricane. Maria posed no immediate threat to the U.S. mainland. The long-range forecast showed the storm out in the Atlantic Ocean hundreds of miles off the Georgia-South Carolina coast by Monday morning. Previously a Category 5 with 175 mph (281 kph) winds, Maria hit Puerto Rico as the third-strongest storm to make landfall in the U.S., based on its central pressure. It was even stronger than Hurricane Irma when Irma roared into the Florida Keys earlier this month. Irma sideswiped Puerto Rico on Sept. 6, causing no deaths or widespread damage on the island but leaving more than 1 million people without electricity. More than 70,000 still had no power as Maria approached.